Good to see Adele back again and this week marks a very special day in the history of Tickled To Tangle. It’s the first birthday of “It’s a String Thing”! To mark the occasion, Adele has created a string for us to use (it can be seen here) which has more than a nod to a birthday candle. The tangles this week are some which have been published recently, plus one from the very first challenge. They are Meringue, A-Fog, Roscoe, Kitl and Lotus Pods. 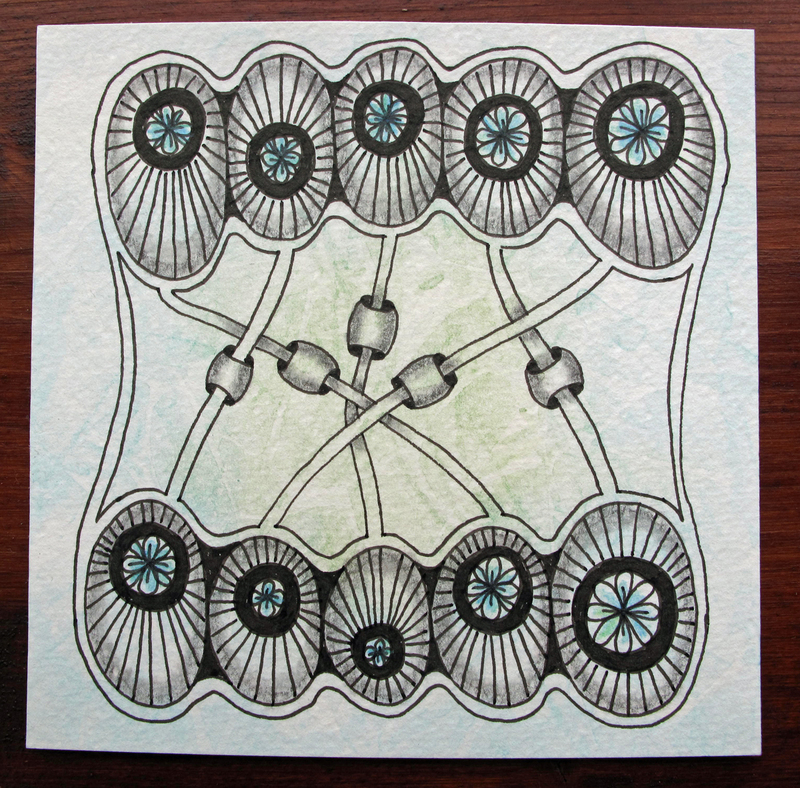 I used all of the tangles and really enjoyed doing this tile. The sun was out and the birds were twittering away in the garden whilst I was happily tangling away. I do love tangles with lots of line work so I really was in my element this week. The challenge on the Diva’s blog this week is to use the new Bijou tiles which are only 2″x2″. 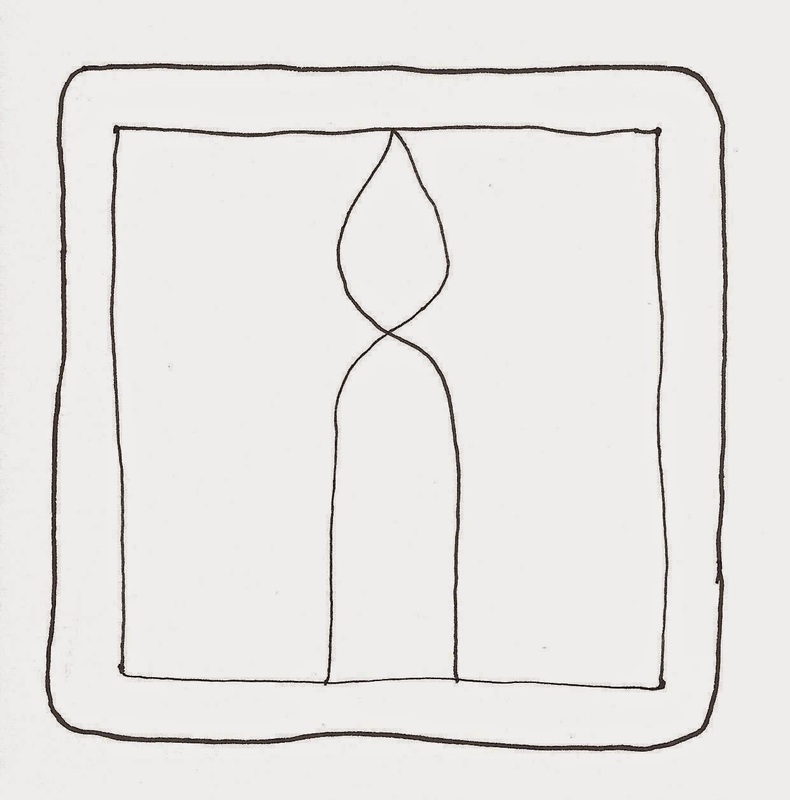 The suggestion is that this smaller size of tile is perfect for monotangles, tangle-studies, or for when you only have a few minutes. I must admit that I don’t tend to do quick tangles which only take a few minutes, I like to set some time aside to relax and spend an hour or two. So for me I thought that the new Bijou size of tile would be perfect for trying out ideas and this is what I have done today. 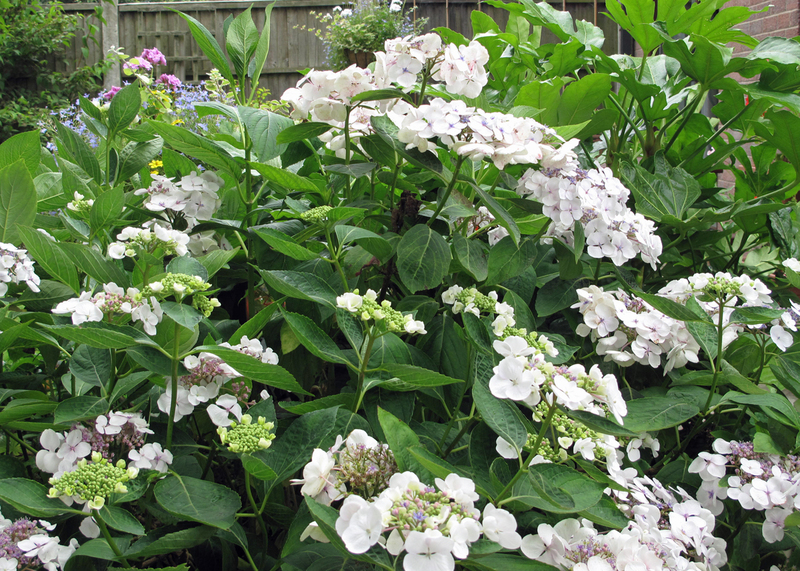 In my garden I have a hydrangea which has been in for a number of years. Last year it didn’t flower at all. This year it has had more flowers than it has ever had before and instead of being predominantly white, the flowers are starting to look a little pink, or even blue in some cases. Every time I look at it I am reminded of the Buttercup tangle. 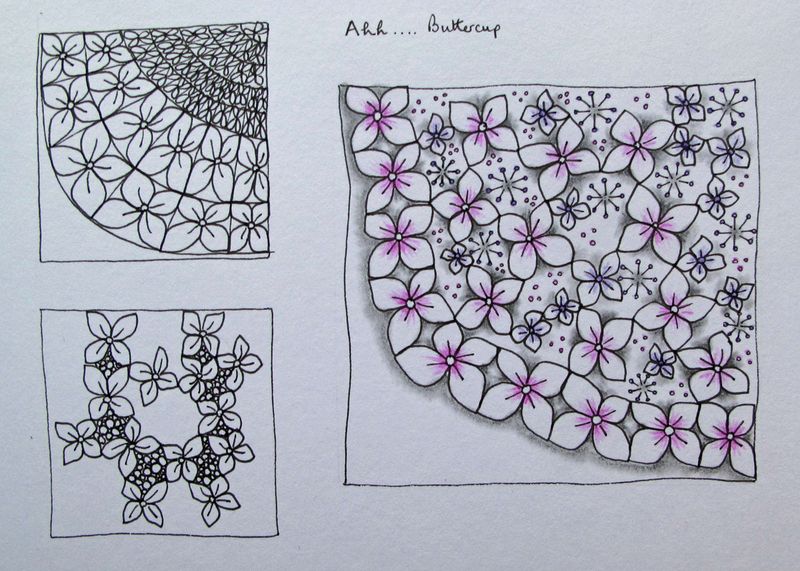 So today I decided to play with Buttercup then do a tile with my hydrangea as inspiration. Also inspired by Helen Williams on her blog a little lime, I wanted to do some ‘out of the grid’ buttercups. I’m off now to see what everyone else has decided to do with this new small tile. If you haven’t already visited to look for yourself I suggest that you do so. I can’t believe another week has gone by, but here we are again with another String Thing. 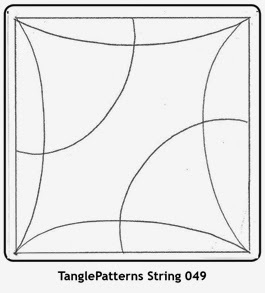 This week’s string was created by Linda Farmer of TanglePatterns. She created it just over a year ago to celebrate her third anniversary hosting the TanglePatterns site. “It’s a String Thing” is also approaching its first anniversary, so it’s time to celebrate! To honour Linda, we can use some tangle patterns that begin with the letters ‘Fa’. They are Facets, Fancy Nancy, Falz and Fandango. 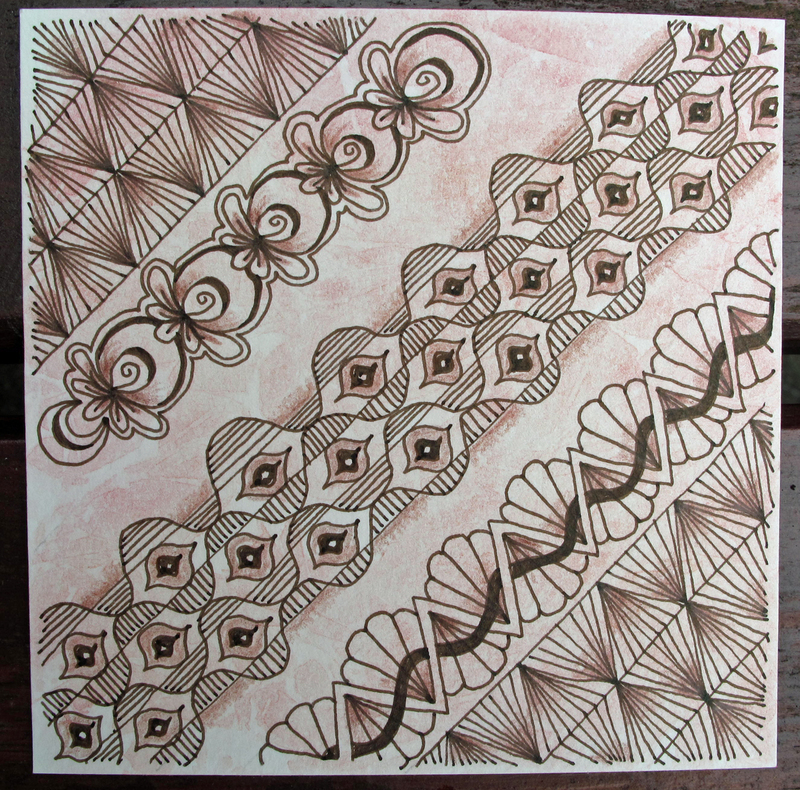 I used all four tangles on a colour washed tile, with a brown pen and brown crayon for shading. Laura is back from her break so this week she has set the challenge on her blog I am the Diva. 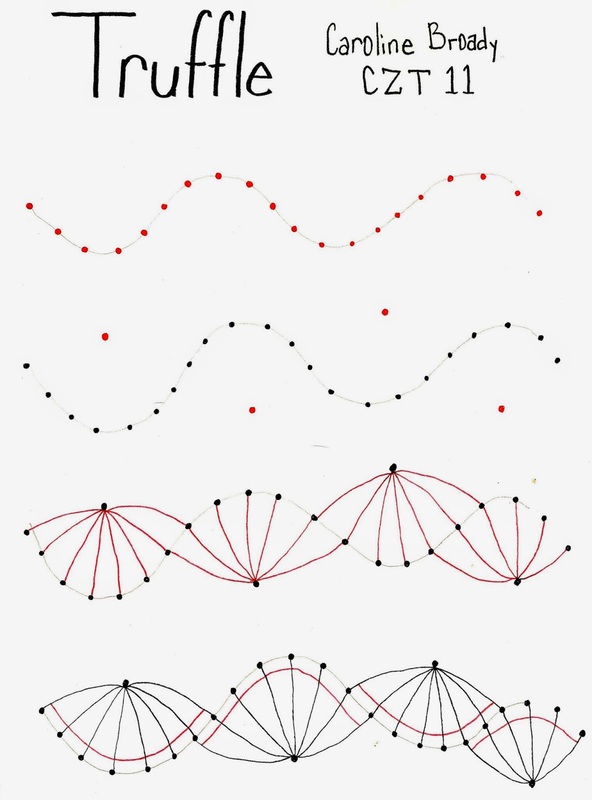 The challenge is to do a Duotangle using tangles which begin with our own initials. So for me that’s L and B.
I love Laced and I use it a lot. On the other hand I’ve never used Borbz so it seemed like a good time to give it a go. 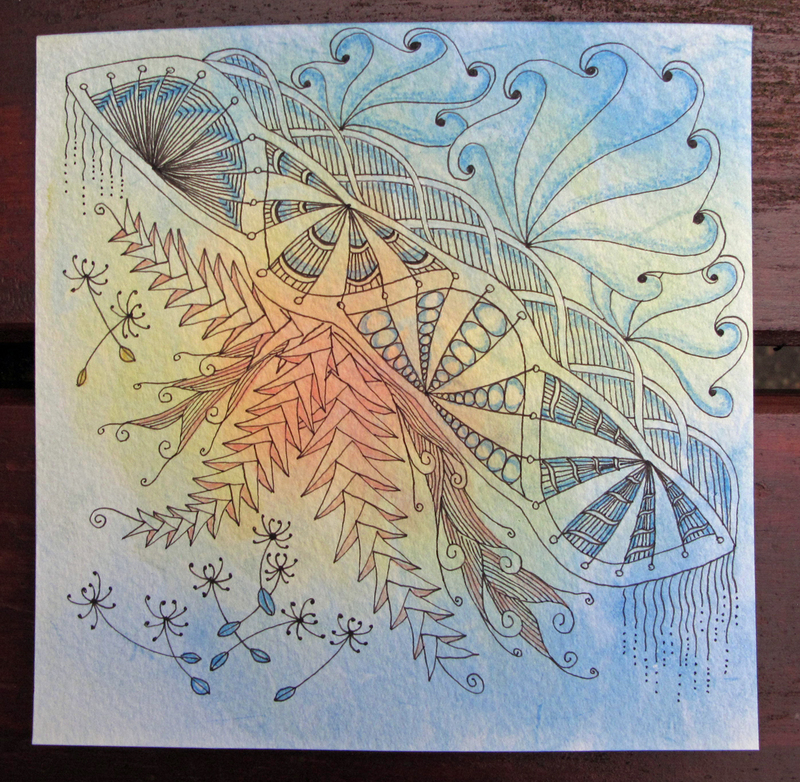 I used another of my watercolour washed cards. Recently I was made aware of a Facebook group called Ornation Creation. There are lots of templates on this page and new ones are posted on a weekly basis. 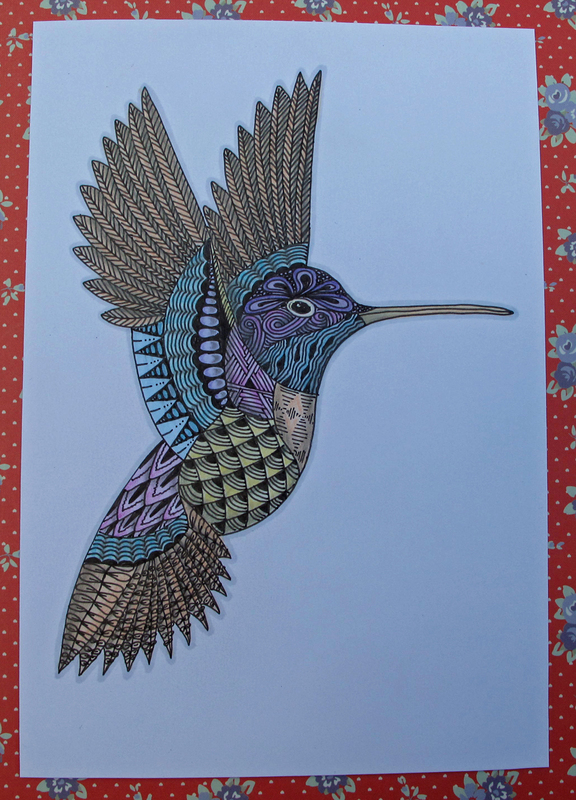 The humming-bird template caught my eye and yesterday I copied and decorated it. It made a change and maybe I’ll try out another template some time, but for me, for a sense of achievement, there’s nothing like starting from scratch with a blank piece of paper! That’s it from me, now I’m off to check out the Diva’s blog to see what everyone else has done with their initials. 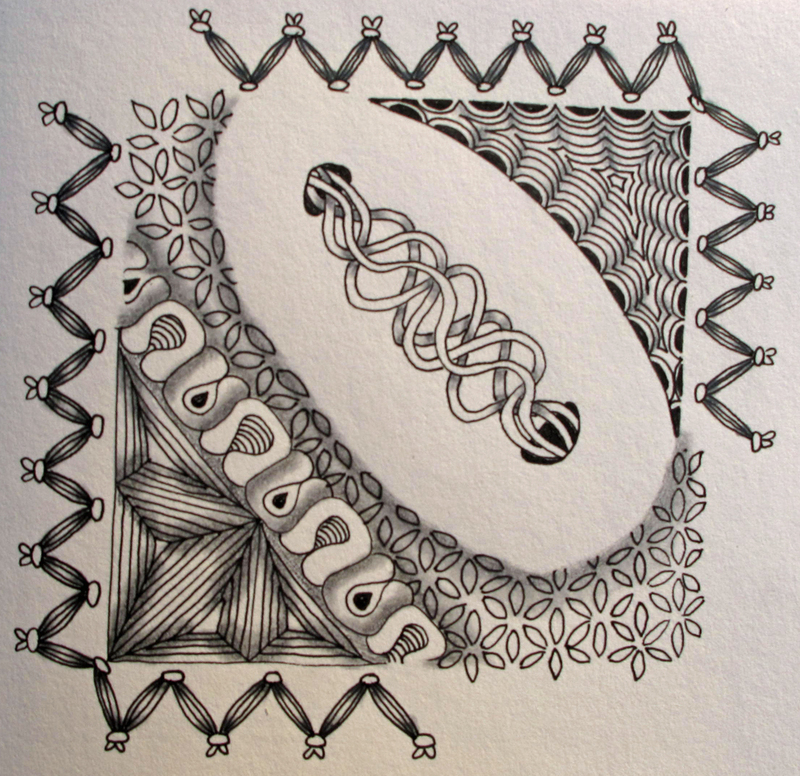 This week the challenge on Tickled to Tangle uses a string from Cathy Clifford (which can be seen here) and in honour of Cathy uses tangles with two ‘C’s in their names. I’ve used Cack, Ciceron, Cockles & Muscles and Crescent Moon. 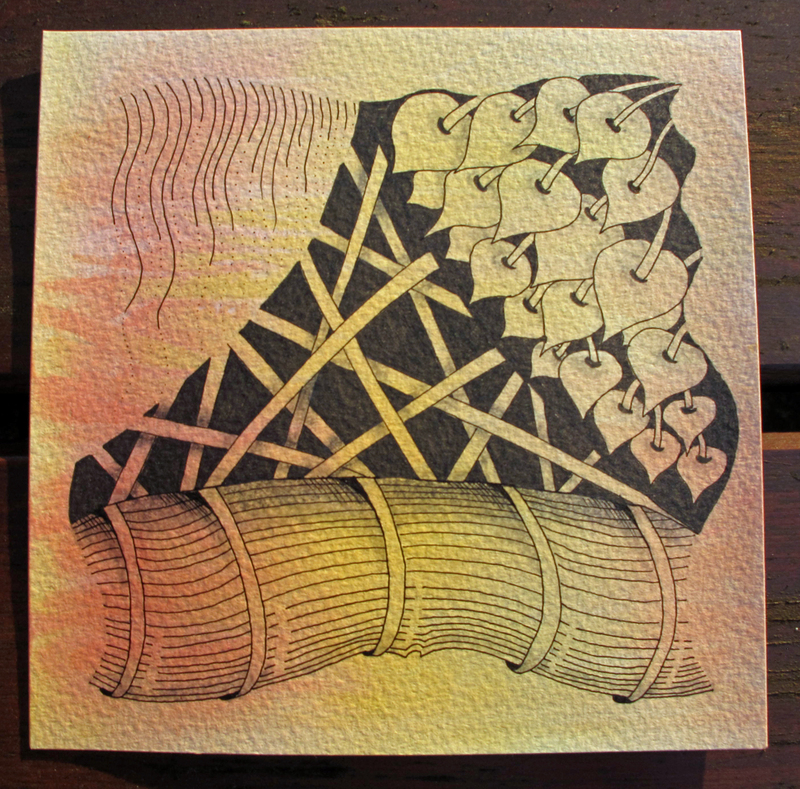 I used some card which I had washed earlier in the week with browns from my tin of Caran d’Ache wax pastels. I’ve used Ciceron, Cockles & Muscles and Crescent Moon before and was determined to link them in some way. I really enjoyed learning to use Adele’s tangle called Cack, playing with different sizes and hiding some behind others. It’s a great tangle Adele! There is another guest challenger this week on the Diva’s blog. 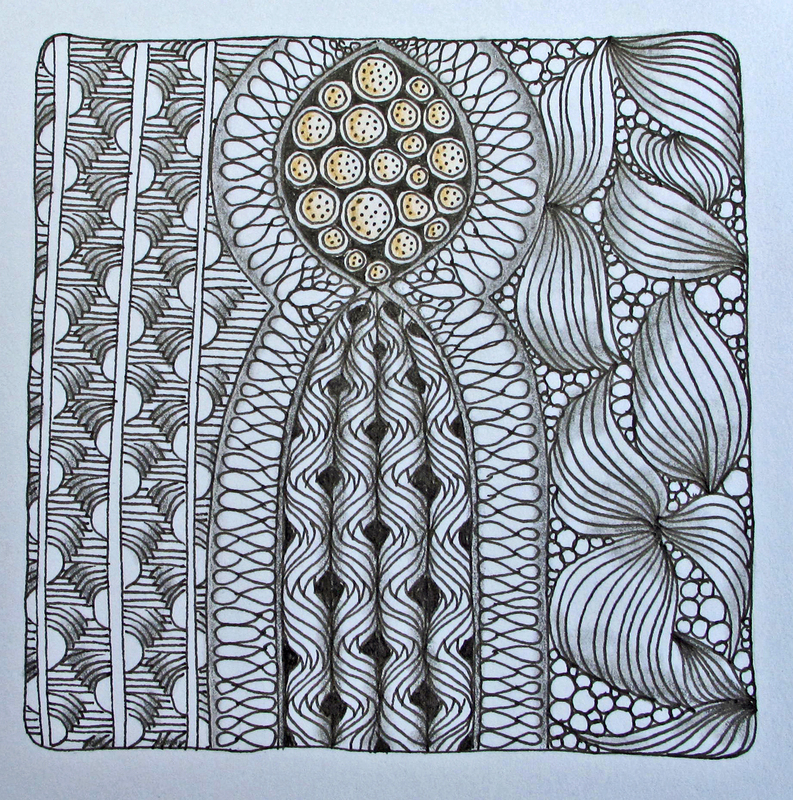 Caroline Broady is one of the world’s youngest Certified Zentangle Teachers and has challenged us to use a tangle which she developed herself, called Truffle. The step-outs can be found here. Last week I mentioned that I had been playing with Brusho and cling film to make some coloured background paper at my first workshop with a CZT. We used one at the workshop and the other was left for us to use whenever we liked. I decided to use it this week for Truffle. I used coloured pencils for the shading but I didn’t find them as easy to use. More practice needed I think. This week because my Monday night class has finished for the summer I’ve managed to do my tangle much earlier than normal so there aren’t so many others to look at yet. Will need to keep bobbing back to check out the rest of the entries. Recommend that you do so too. 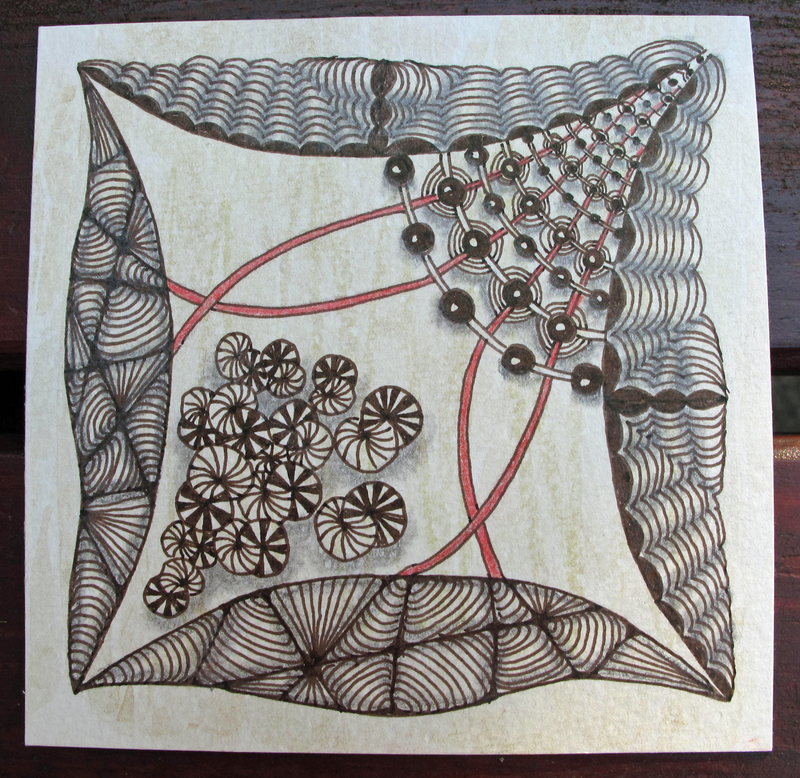 This week the It’s a String Thing challenge marks a very special anniversary in the world of all things Zentangle®. Ten years ago, on July 17, co-founders Rick Roberts and Maria Thomas taught their first public class in Providence, Rhode Island. 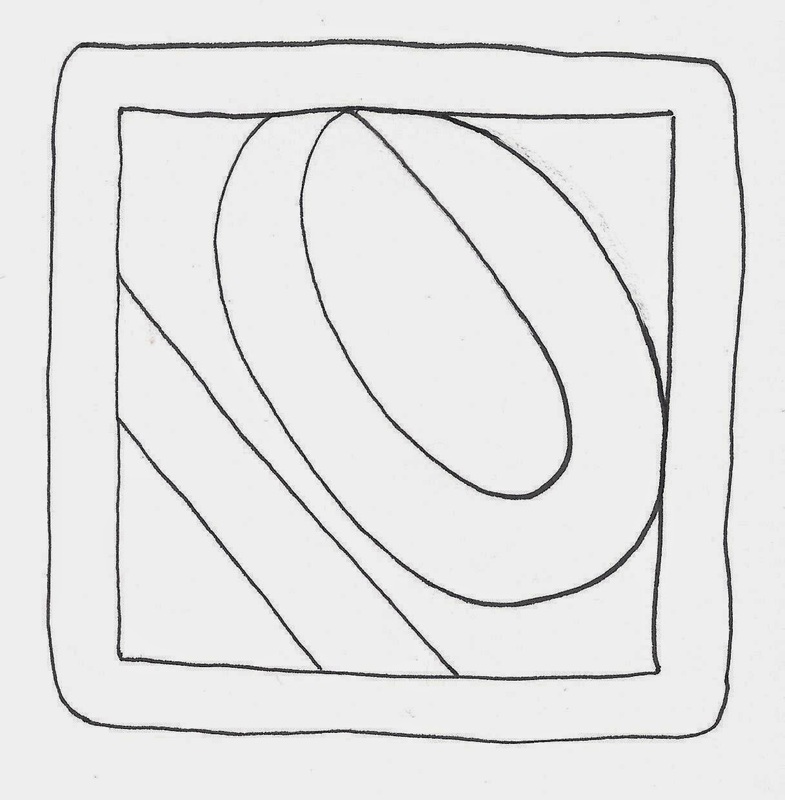 In celebration of their ten-year anniversary, Adele Bruno has created a celebratory string line which can be seen here. The challenge this week is to use this string line and any tangles that we wish. I like that this challenge usually prescribes tangles which makes me try ones that I may not ordinarily be drawn towards, so I included a couple of new tangles to me, they were Quib and Ona. I also used Crescent Moon, Quandary, Prestwood, and Fassett.